HP blew our minds away with last year’s Envy model, lacing the laptop with Beats By Dre audio technology and donning it in the audio brand’s signature color scheme. The computer giant has switched gears with its latest HP Envy lineup: introducing an all-new redesign, six-speaker system with two subwoofers, and the soon-to-be-favored BBD analog volume control. Changing sound levels on a laptop has never been so soothing. 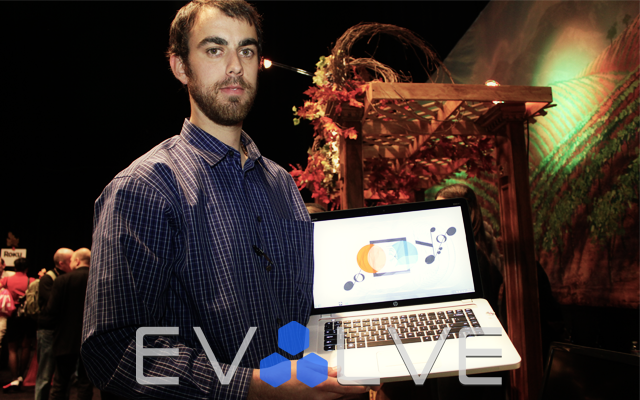 Edelman PR frontman Conor Driscoll gives EvolveTV the goods on the new HP Envy 15 and 17 3D versions, while touching on the portable PC’s key wireless audio and customization features. Here’s our exclusive look. Find pricing and other key specs via HP press release excerpts beneath the clip. Featuring a new HP Radiance Backlit keyboard, the HP ENVY notebooks provide outstanding illumination using individual LEDs dedicated to each keycap. The keyboard also works with an advanced proximity sensor to illuminate when it detects a user approaching the notebook and deactivate after the user leaves. With six powerful speakers and a subwoofer, the HP ENVY notebooks deliver an optimal sound experience, featuring Beats Audio™, an exclusive, high-performance technology developed by HP and Beats by Dr. Dre. A new aluminum analog volume dial acts as a visual design cue, working seamlessly with the Beats Audio Manager so users can easily and precisely adjust audio levels. The HP ENVY 15 and ENVY 17 provide the powerful performance needed for even the most demanding tasks, with optional Intel® Quad Core™ and AMD Mobility Radeon™ high-definition (HD)(1) graphic processors. With optional 3×3 wireless technology, the HP ENVY notebooks offer up to three times the speed and twice the range of typical network connections. The ENVY 15 and ENVY 17 are available with optional Radiance Full HD Infinity displays(1) – either 15.6-inch or 17.3-inch diagonal, respectively. Radiance displays offer higher resolution, richer color, better brightness and wider viewing angles than traditional notebook displays. The ENVY 17 display boasts 50 percent greater brightness than standard. Other innovations featured in both ENVY notebooks include HP CoolSense technology, which automatically adjusts performance and internal fan settings for a noticeably cooler PC, and HP ImagePad, for precise multifinger touch navigation. Fast boot and resume times, a performance-tuned software image that includes two full years of preinstalled Norton™ Internet Security, and a dedicated concierge phone line for technical support deliver a premium experience to ENVY users. For those seeking the ultimate multimedia experience, the HP ENVY 17 3D offers the best 3-D visual experience in a notebook PC. In addition to all the features of the ENVY 17, the ENVY 17 3D provides 1080p full HD(1) viewing along with improved viewing angles and color gamut for all 2-D and 3-D content. HP 3D Active Shutter Glasses provide a seamless viewing experience by wirelessly synchronizing each frame of the 3-D content between the display and glasses, resulting in crisp 3-D Blu-ray viewing as all 3-D content appears in full HD(1) resolution. Using the same technology integrated into the new HP ENVY notebooks, HP Wireless Audio transforms a notebook or desktop PC into a full home audio system. Users can stream uncompressed audio to up to four external devices or directly to any KleerNet device. Advanced tri-band connectivity reduces interference, lag time and latency for the highest sound quality. The thumb-sized dongle attaches to any PC and the tiny receiver attaches to legacy speakers through its two analog or two digital ports. An ideal companion to the new HP ENVY notebooks, the HP Wi-Fi Touch Mouse X7000 features a sculpted shape and glossy black finish. The standard-sized wireless mouse comes equipped with an innovative capacitive-touch scroll and six customizable buttons, including a button for one-touch uploads to Facebook. It stays connected up to 30 feet away with no wires or USB dongle required and has a battery life of up to nine months(2) – twice as long as that of comparable Bluetooth® models. The HP ENVY 15 has a starting price of $1,099.99. The HP ENVY 17 has a starting price of $1,249.99. The HP ENVY 17 3D has a starting price of $1,599.99. HP Wireless Audio is expected to be available mid-December for $99.99, and the HP Wi-Fi Touch Mouse X7000 is available now at the HP Home & Home Office store for $59.99.